Notice: I will not be updating ModMaker any longer, at least for the time being. There are too many bugs and I do not have the time to fix them. Thanks to everyone that has supported the project. Donate to help me keep ModMaker updated! I have created an easy-to-use, very interactive program in Java which will generate and compile ModLoader compatible Minecraft mods without MCP setup or other installations. It currently contains features such as block creation, item/tool creation, recipes, furnace recipes, and simple mob creation (somewhat of a WIP). It is still in development, and feedback/bug reports are appreciated. Sandwich01 and TheBigCreeper are trusted friends... listen to them. Disclaimer: Feel free to share your mods with friends, but DO NOT post any mods made with this program under the "Mapping and Modding" forum OR on PlanetMinecraft.com, especially if the mod is being hosted for profit. Including mods with maps or other creations is fine and encouraged. Disclamer #2: Any loss of data as a result of this program or a mod created with this program is not my responsibility (shouldn't be a problem). Incomplete list of program properties and their descriptions. Some are missing. Items/name/The name assigned to this element. This is used primarily in code. See displayName. Items/displayName/Name to be shown in the inventory tooltip. Items/texturePath/The path to the directory of the item texture. Items/foodLevel/The amount of half-haunches replaced uponeating. Items/toolType/The tool type that this item will have. Items/toolMaterial/A custom tool material(See New Item > Tool Material). Items/maxStackSize/The maximum amount of this item thatone stack can hold. Items/armorType/The armor type that this item will have. Items/armorMaterial/A custom armor material(See New Item > Armor Material). Items/saturation/The saturation value of this item.Only applies if foodLevel > 0. Recipes/upperRight/The item or block in the corresponding inventory slot. Recipes/upperCenter/The item or block in the corresponding inventory slot. Recipes/upperLeft/The item or block in the corresponding inventory slot. Recipes/middleRight/The item or block in the corresponding inventory slot. 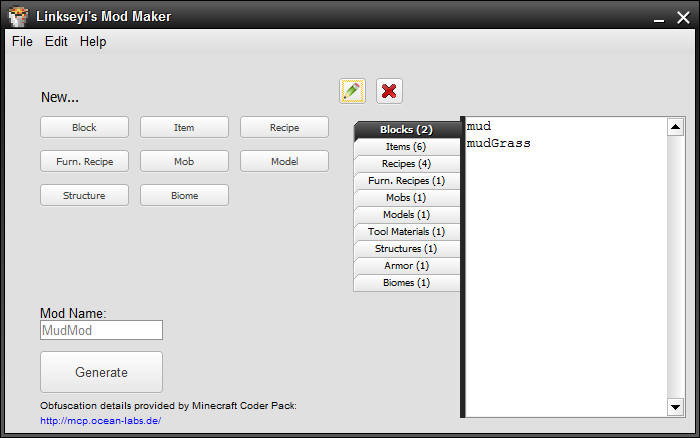 Recipes/middleCenter/The item or block in the corresponding inventory slot. Recipes/middleLeft/The item or block in the corresponding inventory slot. Recipes/lowerRight/The item or block in the corresponding inventory slot. Recipes/lowerCenter/The item or block in the corresponding inventory slot. Recipes/lowerLeft/The item or block in the corresponding inventory slot. Recipes/outputNumber/Amount of result created by this recipe. Recipes/output/The output block or item. Recipes/shapeless/Whether this recipe requires a definite shape. FurnaceRecipes/input/Input value for the furnace recipe. FurnaceRecipes/output/Output value for the furnace recipe. FurnaceRecipes/outputNumber/Amount of output created per smelt. FurnaceRecipes/experience/Factor of experience generated from this recipe. Mobs/spawnProbability/Likelihood of a group of mobs spawning. Mobs/minPerChunk/Minimum amount of mobs spawning. Mobs/maxPerChunk/Maximum amount of mobs spawning. Mobs/modelType/Type of mob render model. Mobs/texturePath/Texture to be rendered on mob. Mobs/moveSpeed/Speed of the mob while walking. Mobs/attackDamage/Amount of half-hearts dealt by monster. Mobs/maxHealth/Amount of half-hearts in a monster's health. Mobs/despawn/Whether this mob will despawn when unloaded. Mobs/biomes/Biomes to spawn this mob in. If none are selected, it will spawn in all. Mobs/spawnNaturally/Speed of the mob while walking. ToolMaterials/harvestLevel/The corresponding material this tool will harvest with. ToolMaterials/entityDamage/Amount of damage dealt to mobs. ToolMaterials/repairMaterial/Block or item this tool will repair with in anvils. Armor/renderPath1/The texture file used to render this armor on a player. (Find in game files). Armor/renderPath2/The texture file used to render this armor on a player. (Find in game files). Armor/repairMaterial/Block or item this armor will repair with in anvils. Structures/schematic/The MCEdit .schematic file to use as a structure generation. Structures/replacement1/Any blocks in the schematic with the given ID will be replaced with the given block. Structures/replacement2/Any blocks in the schematic with the given ID will be replaced with the given block. Structures/replacement3/Any blocks in the schematic with the given ID will be replaced with the given block. Structures/replacement4/Any blocks in the schematic with the given ID will be replaced with the given block. Structures/rarity/Rarity of this structure's generation. Structures/maxHeight/Maximum height at which this structure will generate if not on surface. Structures/genOnTop/Whether this block will generate on the first layer of air. Structures/generateNaturally/Whether to generate on chunk gen.
Structures/biomes/Biomes which this structure can be generated in. Biomes/color/Biome color (used in generation algorithm). Biomes/biomeId/Identifier for this biome must be unique. Biomes/topBlock/The top level block that this biome generates (such as grass). Biomes/fillerBlock/The filler blocks that generate under the top block (such as dirt). Biomes/disableRain/Whether rain is diabled in this biome. To install Linkseyi's ModMaker, download the zip file hosted on this forum thread, and extract it to a permanent location. To run the program, open Linkseyi's ModMaker.exe or ModMaker.jar. Once you have created your mod to your specifications, you can generate a mod jar by clicking the "Generate" button and selecting a destination. Run it. It will create a new profile in your .minecraft/versions/ folder. Copy the output Jar file from the destination folder to the /mods/ folder within .minecraft. Run Minecraft with the Forge profile. Cant Wait Love The Mobs Too Took Me For Ever To Make My Dimmensions With Mobs! Cant Wait LIKE THIS MOD! Good job. I look forward to future development. It was a good idea to add an alternative link. MediaFire fails all my uploads but I'll keep trying. I added a direct link just for you. Hey, is there a way to use some mod files that you have already created with this? Like, say you already have a mod_ file, but you want to use this to make something because you are too lazy/don't know how/cant find tut/ whatever reason? @mercury19 unfortunately, all the files are generated pre-obfuscated, so they aren't compatible with Minecraft Coder Pack. Unless you are writing a mod with obfuscation (which I doubt you are), it wouldn't work. People have made Mod Creators in the past and have experienced problems in that the forums were plagued with "no-value" mods. The purpose of these mods is mainly to try for yourself and share with your friends. If you want to share somewhere outside Minecraft Forums, it's fine by me. Ok, I was just making it clear, thank you for this, also... I have a problem. It wont open. I gives the loading cursor then never opens. I tried to open it as Admin and it didnt work either. Im running Windows Vista, can you help me with this? Make sure Java is installed and up-to-date. Also, are you on a Mac? It may be a bug and I will try to fix it ASAP. I'm having problems with my mod, it won't make the mod_ folder. Is there any way to fix this? Great idea, looking forward to seeing how it does! You don't seem to need forge or the item ID fix mods... so how do you get around the object limits Minecraft has? Before I monkey around with this I'd like to be sure it won't have issues with running out of sprite indices or some such thing. It'd be nice if you allowed people to post their mods as links in this forum, so you or somebody can compile a suite of mods that you can include as an optional download; that way everyone using your mod has matching data for things like new blocks and such. Otherwise you'll end up with the situation like Forge having no less than three copper ores from different mods (at least in the Technic Pack). For an example of this concept, see the Extra Biomes XL mod. Finally, does this allow for surface (or exposed cave)-type features - trees, grass/plants, farmables, flowers, mushrooms, stalagmites, coral, sea-weed, etc.? Including plants that can be bone-mealed? Ask a stupid question, get set on fire. Looks very nice! I'll be downloading this!